This certainly does an excellent job of grabbing your attention. 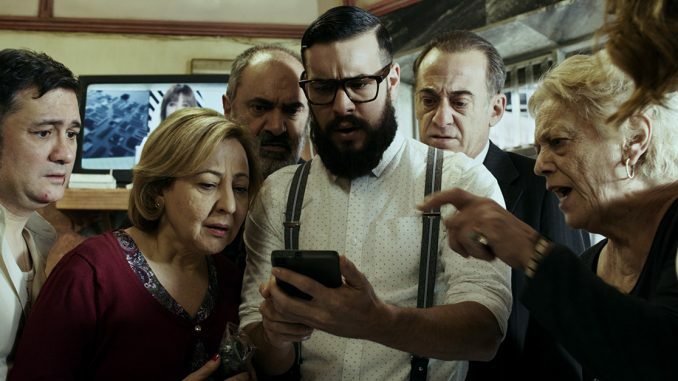 The customers and staff at a Madrid dive-bar, suddenly discover that if any of them try to leave, they are picked off by unseen snipers. What the hell is going on? That question is largely what drives the rest of this narrative. As unfortunately is usual in such things, the script is better as asking the question than answering it. But especially in the first half, there is still some entertainment value to had from the slow revealing of data points, the piecing together of the puzzle by the unwilling residents, and the disintegration as the group turns in on itself. Eventually, this paranoia leads to a schism, with the participants being split into two, and the section perceived as a threat are locked into the pub’s beer-cellar. This turns out to be their (temporary) salvation, as the captives locate a drain which offers a potential way out. But is it big enough for anyone to fit through? A further Mcguffin, in the shape of a set of syringes, fractures the group further, and that’s a problem. For the the movie doesn’t seem to see that its strength is actually as an ensemble piece. 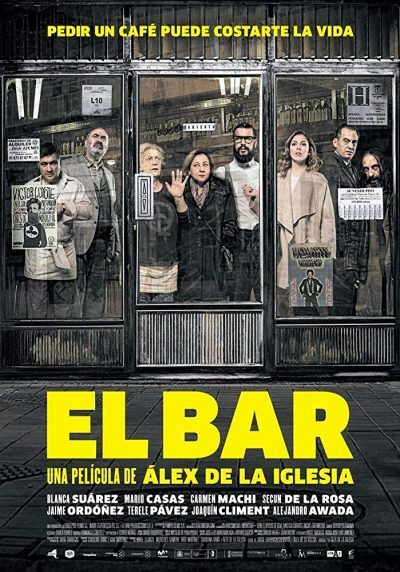 Early on, it works perfectly well, almost as a microcosm of Spanish society, with archetypes from the businessman through to the homeless guy. Each subsequent slice, slimming down the cast, takes away from that aspect, until you just have a bunch of people roaming the sewers below Madrid. It’s a shame, since the opening act is great, beginning with a tracking shot through the square, where you’re left trying to pick up clues about who is or isn’t important. Once we get into the bar, the same uncertainty continues, only you’re now going off the dialogue as you try to decide who will be the focus. de la Iglesia does a very even-handed job here, giving each of the characters a purpose and an agenda. Unfortunately, how interesting these are, is not reflected in their survival chances: arguably the most intriguing members of the ensemble do not survive past the first act. Conversely, the ranting homeless guy/Jesus freak gets to go on, well past the expiration date of the (limited) amusement he provides. The sharp and consistent building of tension leads to an early peak, after which the return here declines slowly over the remainder of the movie. Watching these characters fence verbally is one thing; watching them bicker ceaselessly, quite another. It’s a fine line, admittedly, and a shame the film doesn’t seem to appreciate the difference. By the time the final survivor eventually hauls themselves out of the underground muck, into an uncertain future, I was hard pushed to care particularly much about what might then befall them, or the specific details that might explain the situation. And going by the lack of definitive resolution offered, it seems de la Iglesia might have felt the same disinterest.